With the three conference themes of investigating, invigorating and innovating, we will be widening our horizons with talks from outside speakers, looking at ways to improve and streamline our working practices, and learning about software to help us work smarter, not harder. 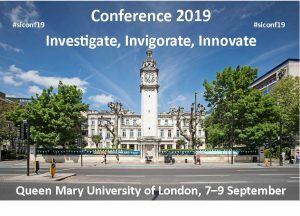 It is 12 years since the conference was last held in the southeast England and we look forward to welcoming members to Queen Mary University of London. Links to programme details and booking information will be on the main conference 2019 page. If you would like to speak at the conference, there’s still time to respond to the Call for Papers.